A well-planned and executed garden bed can change the complexion of a backyard. It can add colour, vibrancy, contrast and energy to an otherwise dull area and it can open the possibilities of a space. Everlast Services have been installing garden beds for over 20 years and we know how to use them to turn a backyard into a masterpiece. A garden bed is a living design element and that’s why they have so many possibilities. Once the bed has been installed you can use the space for almost anything. 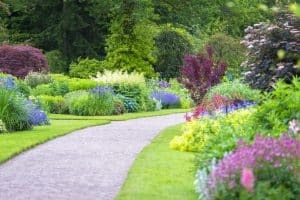 You can even change it over the years by incorporating different plants, so if you love the native look now you can have a native garden bed and if in a couple of years you want something a little more elegant you can turn it into a rose bed. Garden beds add order to a backyard. Even if you want a natural, overgrown look, you still need a garden bed to create the sorts of contrasts that make this look so appealing. Garden beds make gardening far easier. You can fit them out with weed mat so you don’t have to spend your weekends weeding. Garden beds allow you to constantly experiment with your backyard. In a day you can rip out the old plants and have an entire new set planted. Humans are fickle creatures and what we love today, we hate tomorrow. Garden beds give you the freedom to constantly change what you look at when you step outside. Garden beds, especially raised garden beds and boxes, also give you more freedom in the types of plants you can have in your backyard. For example, if you have poor soil quality a raised bed allows you to have a section of good quality soil and plant whatever plant you want. Garden beds become a feature of your backyard in your own right. Whether you go for a timber, stone or steel option you’re sure to turn your backyard into a spectacle. When it comes to installing a garden bed, you want a name you can rely on. Everlast Services has been giving Melbournians a quality landscaping service for over 20 years. That means you can trust the advice we give and the suggestions we make and rest easy in knowing that you will end up with a quality solution. We are 100% Australian owned and operated. Every cent you spend goes straight back into the local economy. By using Everlast Services, you can contribute to our economy and get a fantastic service at the same time. We love what we do. There’s nothing better than leaving behind a smiling customer and we want to make sure that everyone can enjoy our quality service. If you want more than a simple installation service, we can take care of it for you. We offer all types of landscaping services. From lawn installation, to planting and decking; you can enjoy the Everlast Services commitment to quality for the duration of your project without the stress of dealing with multiple contractors.